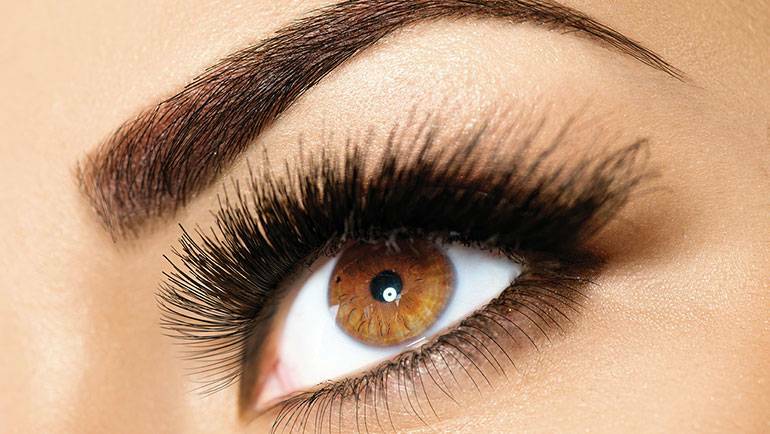 From lash extensions, lifting, tinting and shaping, we offer everything you need to make your eyes pop. Tinting can be used on both the brows and the lashes for anyone looking to add more definition to the face by making the hairs appear thicker and darker. It can also cover grey hairs as well as matching your newly coloured hair. It is a straightforward, painless procedure using vegetable dye to tint your lashes/brows. There are a range of colors for you to choose from to enhance your look and your therapist will advise on which color suits you for the best results. To complete the look the brows can be shaped either by waxing or threading technique. Classic individual eyelash extensions is a technique, whereby false eyelashes are applied carefully and individually to each natural lash on the eye. These lashes can be synthetic, mink or silk and come in various lengths and thickness which is fully customisable to the each client. The trained technician will first assess the natural lashes and select the types of lashes that can be used to achieve your chosen look as well as suitability to your natural lashes so that you are able to maintain healthy growth with the extensions on. All hair goes through growth phases, around 2-3 weeks, your natural eyelashes will reach their final phase and begin to fall out ready for new growth. Unfortunately when they fall out they take the extensions with them so they will start to look sparse and its a good time to book you infills. Eyelash lifts enhance the natural eyelashes by lifting, lengthening and curling them without damaging the natural lashes. This is perfect for clients who like the look of larger lashes but do not want false extensions. They are also used on clients who wish to have a break in between their eyelash extension treatments but still want defined eyelashes. This lasts 6-8 weeks, again as the natural eyelash grows out the effects become less noticeable. Please note patch tests are required at least 48 hours prior to eyelash extensions and tinting appointments. The test involves a procedure of applying a tiny drop of dye/glue on the skin to check if the client is allergic to any ingredient of the products used. Eye infections (conjunctivitis, stye, cyst), contact lens users are advised to remove their lenses during treatment. Being a crewmember in the film industry brings in a lot of stress and constant need to be both indoors and outdoors. The high frequency lights and extreme climates left my skin pre-maturely aged. I feel i cant stop staring at myself in the mirror these days thanks to the highly experienced staff at W1. W1 Tanning and Beauty remains my all-time favorite when it comes to all my beauty enhancement procedures. It’s my one stop solution for all my needs. The Staff is all well trained and professional. Would recommend the same to all my friends. W1 TanningandBeauty operating since 2003, experienced team working here for over 10 years. we offer treatments suitable for men and women. We offer all beauty treatments under one roof, from nails, tanning, waxing, laser hair removal, cellulite removal, dermal fillers and anti-wrinkle injections.